I finished my review of 2011's Fallen by eagerly awaiting this year's contribution to black metal from Varg's still very inky pen, yet Umskiptar has somewhat confounded me by refusing to conform. It isn't easily classifiable as a follow-up to the still excellent Fallen, a complex, layered, hypnotic album - on first listens, Umskiptar is quite more simplistic, longer, easier to listen to but harder to love. 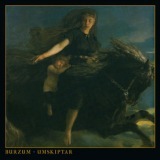 In some ways it's closer to viking metal than to black metal, at least in what we know and expect of Burzum. Based on an old Norse poem and described by Varg as a 'return to the roots'-style album in atmospheric terms, Umskiptar is not a voyage back to the endearingly amateurish ways of Burzum/Aske. It's not even really a follow-up to Fallen, although first track proper Jóln follows the same formula, melodic riffage backed with deceptively simple tip-tapping drumming and Varg's increasingly grandiose spoken vocals. Effective, yet nothing new. Where you will start to feel disquiet and a little surprise is in the delicate piano that opens the following Alfadanz, the song itself a slow, mournful and very professional piece if slightly more repetitive than hypnotic. It could have done with being cut down in length rather, the nine-minute length more than slightly self-indulgent, but as the very similar riff that opens the following Hit Helga Tré shows, this is a very self-indulgent album. Crawling rather than walking, Umskiptar often struggles to hold your interest, the slow and rambling likes of Æra and Heiðr focusing more on bass rumbles and spoken word than actually creating atmosphere. It gets worse. Slightly odd riffing on Valgaldr (more like something from Ihsahn's guitar than Varg's) does suggest a broadening of skills, but in terms of implementation is odd, a whispering, almost dreamy feel to the music notable which continues from then on throughout the album. It works there, but should have been followed by something different, rather than a great deal more of the same, done less well. By the time you've reached Galgviðr, slow strummed riffs with Varg singing, my predictions of Varg becoming something like the black metal Bob Dylan are looking less and less ridiculous. Surtr Sunnan and Gulladr are slow, almost poetic pieces that seem more in keeping with presenting the album as accompaniment to the poem than the opposite, and even finale Níðhöggr is a purely ambient piece. None of Varg's usual talent for ambient pieces is present. Confusingly, the first thoughts you have after finishing Umskiptar are 'is that it?' and 'I'm glad that's over' - Varg proving that he has a previously unrecognised talent for doing little with such a lot. The sheer volume and weight of this album suggest depth and bredth, but in terms of actual subtance it is extraordinarily lacking. It is not by any stretch of the imagination a brilliant album, yet it's the kind of album that teases, that suggests repeated listens will unlock its secrets. Hints of genius in the poetic length and repetitiousness are sadly just echoes of past glories that go unfulfilled here in a very unsatisfying way. Umskiptar should have been a triumph - instead, it is a struggle, and a tedious one at that.